By request, I decided to take a peek at the True Blood series inspired jewelry. True Blood is a series on HBO that was created by the Sookie Stackhouse novels. Keeping up with the latest Vampire Trend (Twilight, The Vampire Diaries…. ya know) HBO is banking on the vampmania. It was only a matter of time before a True Blood jewelry line was created. I am so not disappointed either. Unlike the Twilight jewelry, TB's offers a kind of edgy beauty. The main concept of the line is the infinity symbol, which looks like the number 8 flipped sideways. The collection is mainly silver, red, and black, and comes in a variety of different styles. 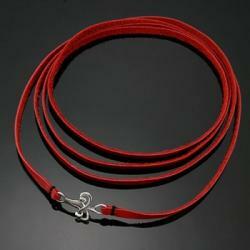 I fell in love with this Red Leather Wrap Bracelet with Silver Fang Clasp. It is so interesting and unique; it's not something you see somebody on the street adorning. Even though it is inspired by True Blood, it can even be appreciated by people who aren't fans of the show. The bracelet wraps around the wrist several times, and uses fang-like clasps which hook into the infinity symbol to secure the piece. It can be worn with that perfect little black dress, or that vintage tee you love so much. The entire TB Jewelry Collection can be found here. There are beautiful pieces are reasonable prices (although still a little too pricey for myself, being a struggling college student with an undecided major, haha). Precious metal jewelry is a favorite adornment as well as a treasured possession. Since the time men unearthed the secret to metal craft, precious metal jewelry has been made and worn by men and women of all ages. 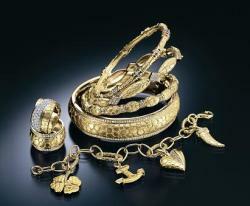 Irrespective of time and space, the craze for gold, silver, and recently platinum jewelry has been on the rise. Although the patterns and the processes keep changing, the appeal of precious metal jewelry is everlasting. Eight metals are considered precious: gold, silver, and the six members of the platinum family – platinum, palladium, rhodium, ruthenium, iridium, and osmium. Precious metals have been a part of human civilization for thousands of years. Often believed to have mystical powers, precious metals have long been appreciated for their value and their beauty. Over time, precious metals came to symbolize wealth, power, and strength. Precious metal bracelets are the perfect accessory to the backdrop for richly-patterned fabrics, like those we see in fashions for spring and summer 2008. Throughout history, gold has been the foundation of many monetary systems and remains important to our economy today. Gold is also a popular metal of jewelry designers because of its versatility. It can be molded, shaped and carved into intricate jewelry designs. Its warm color is very appealing, and it doesn't rust, tarnish or corrode. The major source of the world's gold is South Africa. A rich & splendid 14k yellow gold bracelet in basketweave with a high-polish finish is a gorgeous gift for the love of your life. An accessory she would love to show off. Pure gold is so soft that it is rarely used in jewelry, but rather is mixed with another metal – usually copper or silver – to make a stronger gold alloy, or mixture of metals. The amount of pure gold in an alloy is expressed in karats (versus the carat weight used for measuring diamonds and other gems). The higher the percentage of pure gold, the higher the karat. Pure gold is 24K, while 10K gold – the minimum that may legally be called karat gold in the United States – is 10 parts gold to 14 parts other metal. The standard is 14K in the United States, 18K in Europe, and 22K in India, Japan and some other Asian countries. "Solid gold" refers to an item that contains some gold (at least 10K) and is not hollow. "Gold-filled" is a process by which a layer of gold (at least 10K) is mechanically bonded to a base metal. "Gold-plated" means that an item has a plating (or coating) of gold alloy of at least 10K, though usually less gold than in gold-filled items. As the karat weight drops, the metal becomes more durable but less yellow. Sometimes gold that is a lower karat weight will be plated in high-karat gold to enhance the color. This is perfectly acceptable as long as you pay a fair price. Keep in mind that gold plating will wear off with time, and the jewelry may need to be re-plated. The surface of gold jewelry is treated in many ways to enhance the design. Styles like satin, brushed or matte that create soft, lustrous looks to a hammered finish that produces a bright, irregular surface texture offer consumers a variety of looks. White gold has the same properties as yellow gold, but it has been alloyed with different metals, like nickel, zinc, or platinum to give it a white color. White gold should not be confused with platinum, which is much rarer than gold and hence more valuable. This 14k Toggle Art Collection bracelet in white gold is finished with a lobster lock. The same karat weight system is used for both white gold and yellow gold. While 18k yellow gold and 18k white gold contain the same proportion of gold, only the remaining 25 percent of the alloy is different. Sometimes white gold is plated with an even whiter metal, such as rhodium (a very rare member of the platinum family), to enhance its appearance. White gold was developed to give a different look to jewelry. The white color is an excellent setting for very white diamonds, and when used side by side with yellow gold, it creates a striking effect. Jewelry using both white and yellow gold is called "two-tone." The most precious metal used in jewelry is platinum. Heavier and more durable than gold, platinum is very expensive, and is alloyed with other precious metals for added strength. Platinum jewelry is usually produced from an alloy of 90 percent platinum and 10 percent iridium, two of the precious metals in the platinum family. This stunning cuff bracelet is made up of brightly polished platinum with 5.5 mm in width and 7 1/4 inch in length. 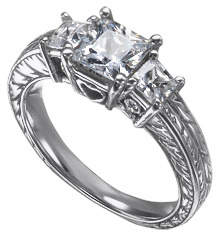 Because of its purity, platinum is excellent for people who are allergic to other metals. Platinum will never tarnish or wear out, and its light color makes it popular for jewelry. Like white gold, platinum settings make white diamonds appear very bright, but platinum is whiter in color and heavier than white gold. Used extensively in jewelry throughout the first half of the 20th century, platinum was banned for use in non-military applications during World War II. However, it has enjoyed an enormous resurgence in popularity in recent years. Mined in Africa, Russia and the United States (Montana), platinum is not sold according to karat weight. Platinum jewelry that is stamped with a quality mark also shows the percentage of platinum used in the alloy. The standard for sterling silver has remained unchanged since 1300, when Edward I of England established an early trade practice for silversmiths, decreeing that sterling must consist of 92.5 percent pure silver alloyed with 7.5 percent copper. The term sterling refers to the composition of the metal. A lovely bracelet made of twisted shiny sterling silver crinkled coins for those ultra cool occasions. Silver is much more plentiful than gold, but silver tends to tarnish, making it less popular in some forms of jewelry. Like gold, silver is too soft for use in its pure state and must be combined with other metals for durability. Jewelry made of silver parts and gold parts must carry dual designations, such as Sterling and 10k. Spring has finally arrived, and with it comes a host of new fashion trends and ideas. One area where spring 2008 will really sparkle is jewelry. 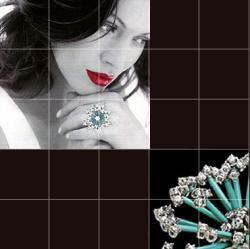 Jewelry styles will run the gamut from classic designs to the sculpted and bold. The trends for jewelry are pretty much the same as those for fashion in general. Expect interesting and bold color combinations. Gemstone jewelry will take on fashion importance this spring. Colors in semi-precious gemstones will be vibrant and luminous – in cabochons and briolettes and in every style of jewelry. Many varieties of quartz have become very popular recently, because their colors are brilliant. This is no time for a wimpy drop necklace. You need a substantial pendant that really makes a fashion statement, and two of the hottest colors will be yellow and its complementary color, purple. Citrine is a transparent variety of silica mineral quartz, pale yellow to Madeira orange in all of its glorious golden color, which comes from the presence of iron. Citrine is a semiprecious gem that is also valued for its resemblance to the more expensive Topaz, yellow Sapphire or yellow Diamond. Geometric-shaped Lepidolite stones are bezel-set in a triangular-shaped sterling silver pendant. The matching Lepidolite nugget necklace is finished with sterling silver end caps. 18k Gold engraved heart-shaped pendant with hand-carved flowers and leaves in intricate patterns. For centuries, Italy has been famous for producing exquisite pieces of Gold jewelry, and this Renaissance-inspired pendant continues that tradition. I know. It looks like a charm bracelet for a giant. But it's not. 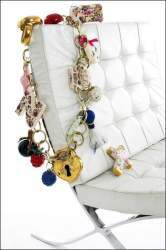 It's actually furniture jewelry, a weird trend in the furniture accesorizing industry. At J. Roaman, a home-furnishings store in East Hampton, N.Y., a painted white iron bed wears a giant charm bracelet over its left head post. The bracelet isn't there because the bed wants for visual interest; it's already enveloped in a brightly colored quilt by Lisa Corti, a Milanese designer, and topped with four pillows, five throw pillows and a bolster. The reason for the jewelry, according to Judi Roaman, a former fashion retailer who opened the store in May, is that furniture, like any carefully curated outfit, should express its owner's personality. "Accessories make the bed into who you want her to be," she explained. The idea that furniture should wear jewelry may strike some people as, well, nuts. But the notion behind it – that the kind of personal style associated with fashion can and should be expressed through home accessorizing, in ways that go far beyond throw pillows – has become a guiding principle of the furnishings industry. 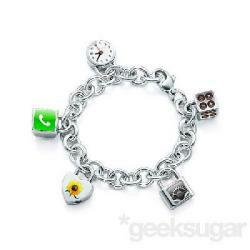 The article goes on to call this "A merging of design worlds," which I find interesting even though I feel a giant-sized charm bracelet may be a wee bit over the top. I'm not a big fan of body jewelry. It's all I could do to get my ears double pierced let alone even thinking about getting any other holes drilled into me. But, because I'm interested in all kinds of jewelry, I thought this trend in fine jewelry for the body jewelry group was interesting. I'm used to seeing things like skulls and rock and roll themed jewelry for those with the holes. But, a company called The Chain Gang, has moved beyond the R&R stigma and turned their designs into fine jewelry pieces with the use of precious metals and gemstones. Pictured is a piece with Swarovski Cubic Zircons and made with your choice of 14kt yellow or white gold. If you prefer the real thing rather than CZ, they can do that too. These earlets also come in gold with a choice of CZ or real gemstones. None of this makes me eager for more holes, but it nice to see that not all body jewelry is what you expect it to be. White metals such as white gold and platinum have surged in popularity over the past decade, but there's one big problem with both of them – as their popularity has surged so has their price tag. So, jewelers have been looking for alternatives to the white gold cost issue and one alternative that is all over the place these days is palladium. Palladium, unlike platinum, comprises only a small chapter in the history of jewelry. Of the platinum group of metals (platinum, palladium, iridium, rhodium, osmium and ruthenium), palladium has the lowest specific gravity and the lowest melting point. [...] Palladium use was not restricted and was soon promoted in the jewelry trade press as a viable alternative to platinum. Because it weighed less than platinum, palladium jewelry could be made larger and still be comfortable to wear; in addition, palladium's malleability made stone setting a breeze. Palladium also could be combined with gold to produce a version of white gold, another substitute for platinum. Despite these advantages, palladium was gradually phased out after World War II when platinum became available again. Palladium does have its drawbacks – [...] Palladium's color may be a pleasing light gray, but it doesn't take a high polish the way platinum does and has a tendency to become dull over time. These disadvantages outweigh palladium's lightweight malleability, and many jewelers refused to work with it once platinum was again available. But jewelers are not working with this metal again, and I've been seeing it all over the place lately. As an alternative to other white metals, I have to confess that I'm not completly sold on it yet. I have a few palladium chains, and they in no way compare to my one precious platinum chain. The metal is much darker, almost like a gun metal but not quite, and so I don't see it as a substitute. As a metal on it's own, yes, and it comes cases if you are looking for a piece of jewelry that has that estate sale look, then yes again, but if you want to try to suggest to others that your palladium ring is a platinum ring, good luck. Here's another antique style ring from Danforth Diamonds. and as I said, this is the type of design that I think palladium is perfect to use with. I've actually already seen this trend over the past year, less jewelry but each piece that is worn is big and bold – one big bracelet, no necklace but super long earrings. While I personally don't feel comfortable in really large jewelry pieces, for that special occasion – red carpet affair for example, it does make sense because of the dramatic statement a few large jewelry pieces can make. Wearing less jewelry pieces is more when it comes to the top jewelry trends for 2008, but the key ingredient for trend-setting fashionistas is larger, bolder styles that are gem-intensive. That advice comes from Jesse Chao of Gems by Chao, a leading Houston fine jeweler. Chao specializes in advising her gala-minded clientele-a mix of socialites and philanthropists-and matching fine jewelry to their personal style. In a statement, Chao said women who are already planning to attend galas will be wearing less fine jewelry but adorning themselves with larger, more impressive pieces, for a classic "grace kelly" look. Consumers can get the look by wearing a single, diamond-studded cuff bracelet or a one-of-a-kind cocktail ring, for example. Big, bold gold jewelry from Hellmuth. While I'm pretty much tied to the computer almost 24/7, I really don't see myself as a geek. I don't have a plastic pencil holder attached to any pockets, nor do my glasses have any kind of white tape holding them together. In fact, while I do have to wear glasses now, I made sure I went to a very chic place and got some top of the line specs. Yes, because I'm that vain. However, non-geek that I am, I still found these new geekie jewelry designs from GeekSugar.com, attractive and I would bet they really would do well just because they are so different and are actually jewelry you could wear. She's talking about platinum and real gemstones, not faux stones you stick on with a glue gun. Hey, you never know! As with their hardcopy magazine, Modern Jeweler tends to be forever on the cutting edge of what's hip and new in the jewelry world, and that's also true with their blog, a fairly recent addition to their media options. Not all corporate blogs seem to "get it" when it comes to being part of the blogosphere, but I think this attempt at mixing corporate brand with jewelry world is working. 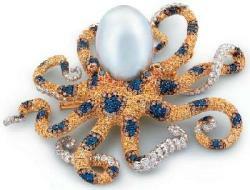 One topic they mentioned recently was that of the affect of crafts on jewelry trends. From "Trendy Crafts & Crafty Trends:"
Trendy crafts may seem like an oxymoron, but one of the strongest trends in the urban scene is DIY handmade items. Knitting is coming back as a pastime. Hand decoration of shoes, shirts, and walls, with its aura of personalization, is replacing logos and brands as a signifier of taste. This influence is spreading into mainstream design as well, of course. In jewelry, hand finishes and organic-looking shapes that show the mark of the craftsman's hand are a very strong trend. Those who don't want to actually do-it-themselves represent a growing market for crafty entrepreneurs with an urban edge. I find this a refreshing point of view from a group that normally focuses on fine jewelry. So many times (and too many), the craft of jewelry is dismissed. With the weather heating up – now almost into the 90s most days down here in sunny Florida, I'm starting to see more and more summer fashion. Now doubt – summer is here! Green is still going to be popular; though, honestly, I haven't seen as much green a I thought I would be seeing these past few months when it comes to jewelry. Stones to keep an eye on include prasiolite and prehenite. Medallion style pendants hanging from chains is still hot. I agree. Now, this I have been seeing a lot of, both as medals and coins set off in metal bezels. It still continues to be all about the circle; this includes bangle bracelets, pendants, rings, and just about anything round such as some jewelry from Staurino Fratelli pictured below. Ethnic inspired jewelry is supposed to be gaining momentum. Due to the increased cost of gold, we'll see more filigree type designs, which look great but cut down on the gram weight. Now, this sounds interesting!